If you're a bookaholic, you've got one, without doubt. One what? A list of favorite authors that make your heart go pitty-pat. Each time one of these authors has a new book released, you simply cannot wait to get your hands on it. You have to have it. You have to feel those virgin pages beneath your fingertips. You have to wrap yourself up in those words and sink slowly, completely, into the story. These authors are the ones who really "get" you. I call these authors "Auto-Buy Authors," and I've been sharing mine with you in a very leisurely fashion. If you'd like to refresh your memory on authors I've already listed, feel free to take a look at chapter one and chapter two. Today I'm sharing three more of my auto-buy authors with you. Each one of them is a wonderful storyteller who can lead me on a roller coaster ride of emotions through settings that are so clear to me it's as though I'm standing next to the main characters. Let's get started! 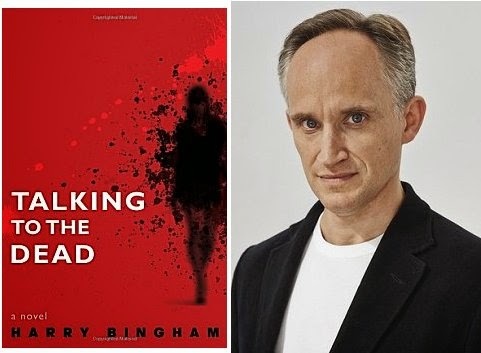 Harry Bingham grabbed me by the throat with his very first Fiona Griffiths novel, Talking to the Dead. Fiona is a detective constable in Wales. She's intense, she's strong, and she's not the easiest person to get to know. Why? Because she's not always truthful, and she tends to have more secrets than any of the investigations in which she becomes embroiled. What is Fiona's main goal in life-- besides putting the bad guys behind bars? She very much wants to be a citizen of Planet Normal. I know. It sounds strange, but Fiona had something happen to her when she was a teenager that sets her apart from any other character I've ever come across. Yes, her investigations are gripping, but discovering the real Fiona is at the very heart of these books, and the reason why I'm willing to pay extra for a UK edition of the latest book to feature her, The Strange Death of Fiona Griffiths. Which reminds me... I need to stop gazing at that book lovingly and read it so I can share it with all of you! A.D. Scott fascinates me. She lives in a small fishing village in Vietnam and journeys back to her roots in the Highlands of Scotland whenever she needs to do research for her books. When she lived in Inverness, where her books are set, she was well acquainted with the Gaelic Church. It wasn't until she read my blog post about Leakey's Bookshop that she realized the church had been turned into a wonderful haven for the printed word. She knew she'd have to visit it on her next research trip. 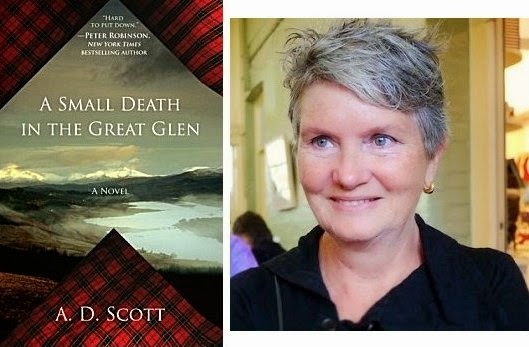 Yes, I do have a tiny connection with this author, and we've shared our favorite places in the Highlands. But even if we didn't, I'd still love her books! They are set in Inverness in the 1950s and revolve around characters who work in the office of the Highland Gazette newspaper. The editor is a fish-out-of-water from Glasgow who wants to turn this small town paper into one of the best in Scotland. Another character is an older man who represents the past and is also full of common sense. Two young men have dreams they want to follow, and the main woman on staff fights against convention by leaving her abusive husband and making a life for herself and her two daughters. They are characters you grow to know and love. You care about their welfare whenever calamity strikes. And you fall in love with Inverness and the surrounding area. The world I live in fades away completely whenever I read one of A.D. Scott's books. 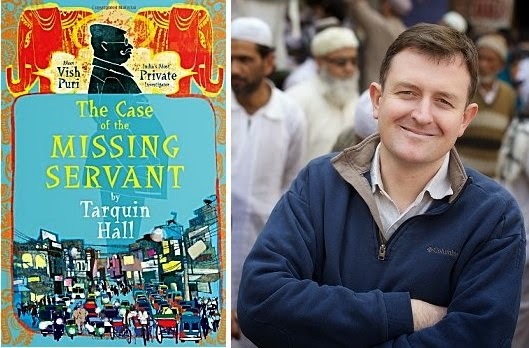 I know of several fans of Tarquin Hall's Vish Puri series who meet in Indian restaurants to discuss his books. Being British, Denis has been a lover of Indian cuisine his entire life, but it wasn't until I began reading the case files of New Delhi private investigator Vish Puri that I decided i wanted to sample it myself. Now Denis and I go to Flavors of India at least once a month. Tarquin Hall has definitely tempted my taste buds, but that's not all he's done. Of all the series I read that are set in other countries, two come to mind immediately for the perfection of their settings. Tarquin Hall writes one of them. As I read, I can't help but feel that I'm getting a true picture of the real India in all its complexity. The importance of family in Indian life. How people really live-- from electricity to transportation to running water to government. How India's history still plays a role in people's lives. It's an intricate picture that Hall brings to life in all its vitality. But he isn't an auto-buy author simply because he paints a multi-layered portrait of a fascinating country. Vish Puri is my favorite private investigator-- a sort of Punjabi Hercule Poirot. He's solved more than one case that kept me guessing right to the end. However, the rotund private eye isn't the only character in the book whom I enjoy. His wife and his mother are guaranteed to make me smile as they bedevil him, and it's a pleasure to get to know more about his employees-- "operatives"-- who are referred to as "Facecream" or "Tubelight" to name two. Tarquin Hall's Vish Puri books are filled with honesty, humor, and love... and I can't get enough. And thus my latest chapter of Auto-Buy Authors draws to a close. Are any of these three on your own list? Which one(s)? Which of your auto-buy authors would you recommend to me? Yes-- this mind is still inquiring and still wanting to know! I don't have a huge number of these kinds of authors as my tastes have changed somewhat over the years, especially as it has become possible for us down here at the bottom of the world to access a wider selection of books. If I look at what I'm reading now versus what I was reading a decade ago there aren't many cross over authors. I suppose I'd have to say Sue Grafton is one who I've stuck by - and if she finished the alphabet then so will I. Others are relatively new to me - two Australian authors - Sulari Gentill (historical crime fiction set in the 30's) and Katherine Howell (police/paramedic procedural). I highly recommend both but you'd probably struggle to get them in your neck of the woods. The only other one I can think of is Elly Griffiths - though perhaps she doesn't qualify as I haven't actually bought her latest yet (I will do - but it's jolly expensive just now). I think I have one of Katherine Howell's books waiting for me on my TBR shelves, and Sulari Gentill has just been added to my wish list. I'm in total agreement with you about Grabenstein (Ceepak) and Griffiths. Love their books! Thanks for adding to my wish list-- I'm always on the lookout for new authors! Adding Paddy Richardson to my wish list. Thanks, Margot! Ah, Cathy, you and I share a lot of the same tastes. Indian food for one. Love it. OK, I've only read one of the Vish Puri books - the first - and why haven't I continued with the series. I meant to. The other two authors have both been on my list (the never ending need to read list) for a while. I'll get to them. Maybe this year. As to my must buys - think I answered on your first one of these a few years ago. But things change and authors are added. OK, now Elly Griffiths (love Ruth Galloway), Michael Robotham (love Joe O'Loughlin), Sharon Bolton, Linda Castillo, Greg Iles, Tana French, Peter May, Lisa Genova (not a mystery author), Elizabeth Haynes (new to me) and to round out 10 - Liane Moriarty (loved BIG LITTLE LIES). Think those might all be different from what I shared the last time. Yes, we do share a lot of the same tastes, Kay. There are many books on my TBR shelves that I mean to get around to reading-- but haven't yet. I think they're meant to come bobbing to the surface when I need them most, so I tend not to stress over it. I've been hearing things about Big Little Lies, so I'll have to check that one out. And Greg Iles' first is sitting on my TBR shelves. One thing I love about these comments is seeing Elly Griffiths' name repeatedly. I love Dr. Ruth Galloway! Another favorite author that I wait for the next book to come out and then buy is M.K.Graff or Marni Graff. There are three books in the series so far. The protagonist is Nora Tierney who is an American living in England. The first book The Blue Virgin is set in Oxford. The second (The Green Remains) and the third (The Scarlet Wench) are set in the Lake District. The books have interesting characters, good plots and are atmospheric which is why I like the Ruth Galloway (Elly Griffiths) series too. Another Galloway fan-- I love it! And thanks for the M.K. Graff recommendation, Lynn. I've added her to my wish list! And here's yet another Ruth Galloway fan -- for a lot of reasons. She is like a real person, not glamorous or physically fit, a single mother, a working woman, juggling childcare and her job. And I like her coterie of friends. I have put A.D. Scott on my TBR-soon list based on Peggy Ann's recommendation. I'm trying to use the library and not buy books, but I have purchased books quickly by Elly Griffiths, Sara Paretsky, Fred Vargas, Tana French, Arnaldur Indridason, Lene Kaaberbol and Agnete Friis, Anne Holt, Liza Marklund and will buy Australian writer Angela Savage's next book when it comes out. I haven't heard of Angela Savage, so thanks for the heads up! Angela Savage writes a heck of a series set in Thailand with her Australian ex-pat detective, Jayne Keeney. She has kindly sent me her first two books and I borrowed the third. However, her books will be available in the U.S. sometime this year. raises social issues, but the plots and characters are good, too. I've got Savage on my wish list now and will keep a lookout for her. Thanks, Kathy! I should have put Malla Nunn on my list above; she writes about 1952 South AFrica under apartheid, and really writes good, interesting plots and characters. And one gets a sense of the horrors of the day. Yes, I've read one of her mysteries and have three more sitting on my TBR shelves. Excellent choice, Kathy! I want to start A.D. Scott's series at the beginning, but my library has a limited selection of her books, so I'll start with what I can find. I'm trying not to buy books at this point. I understand that. Good luck on your search!